Our interactive online map shows the 500 mountains destroyed for coal and how they have been reclaimed- or not. It allows you to "fly down to the mine" to see "wrecklamation" for your self. You can read the official announcement on our press page. Roughly 1.2 million acres, including 500 mountains, have been flattened by mountaintop removal coal mining in the central Appalachian region. Only a fraction of that land has been reclaimed for so-called beneficial economic uses. These are the conculsions of two new studies from Appalachian Voices and the Natural Resources Defense Council that combine to debunk one of Big Coal's biggest lies. Below you will find more details about each study, and you can explore the data through our interactive Reclamation FAIL map. With 95% accuracy, analysis shows that nearly 1.2 million acres (10% of Central Appalachia) have been surface-mined for coal. It also revealed that more than 500 mountains have been severely impacted or destroyed by mountaintop removal coal mining. 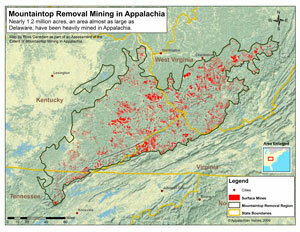 The study was completed in 2009 by Appalachian Voices based on 2008 aerial and mining permit data. 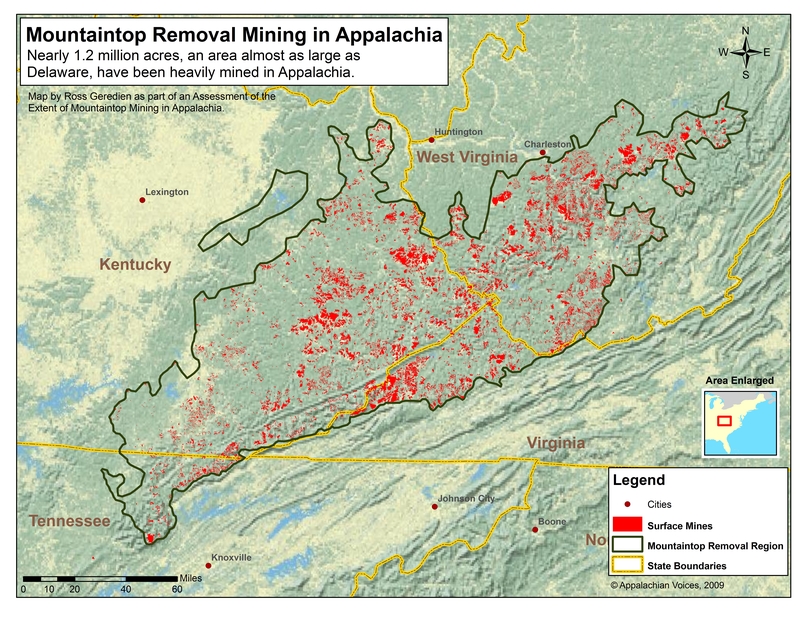 Aerial imagery revealed that only a fraction of mountaintop removal mine sites are reclaimed for economic development projects. The vast majority of sites are in various stages of successional vegetation such as grassland, shrubland, tree plantings, or active mining. Of the 410 reclaimed mountaintop removal mine sites surveyed, 366 (89.3%) had no form of verifiable post-mining development, excluding forestry and pasture. The post-mining land use status of all but 18 mountain locations was identified with a high level of confidence. These 18 locations were identified as having “possible” post- mining economic land uses. Frequently some evidence of potential economic reclamation existing on these sites, such as mowed fields or improved structures, but specific land use was not clear. In some cases, it was not clear whether structures were abandoned or directly connected to former or existing mining activity on site or nearby. 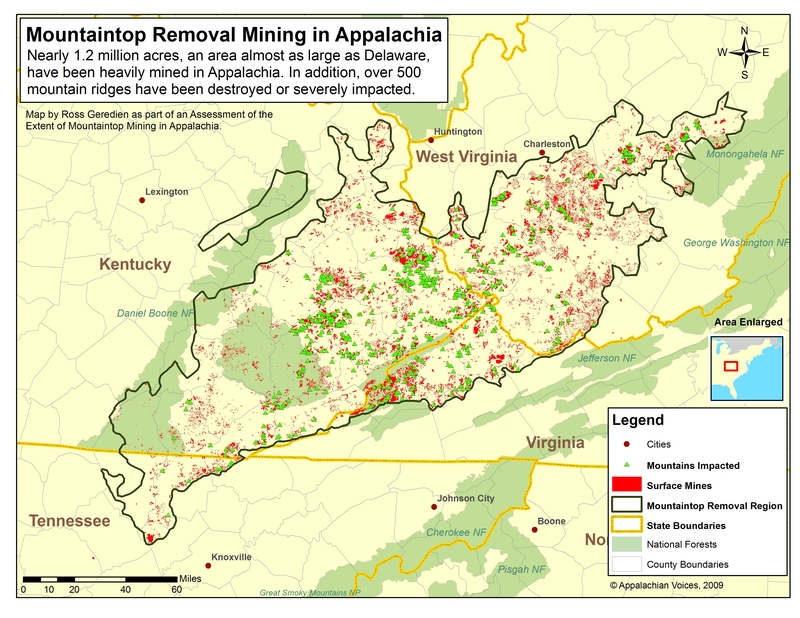 It is clear that mountaintop removal has not yet led to much economic development on reclaimed mine lands in Appalachia, nor is there a shortage of landscapes with flattened topography available for industrial, commercial, or residential post-mining economic development. 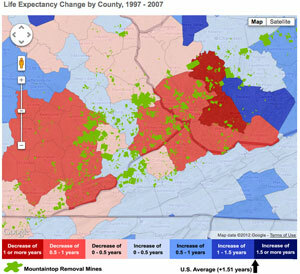 In February 2012, the iLoveMountains.org team launched a startling interactive map: The Human Cost of Coal. It combines a myriad of health and economic statistics with our latest survey of the extent of mountaintop removal mining in Appalachia.